We’re eager to fulfill the mitzvah to visit the sick, in Hebrew, bikkur cholim. Why? On a basic human level it just feels like the right thing to do. But, it’s not enough to do it simply because it seems like the right thing to do. On a deeper level we have to find the reason why visiting the sick is important and why it might really make a difference. After all, it’s the antibiotics, surgeries and therapies that do the healing. At least that’s what we know now. Long ago, when no such therapies were known, healing happened to people who believed that they were part of a system of religion that provided restored health to the sick. In Judaism, we have a prayer that links us to God’s role in healing. We say, “Praised are You, Eternal One, Healer of the sick (rofeh ha-cholim).” Even today, we can infer that modern drugs and means of healing originate in nature and its sources. We give credit to science for their discovery and then credit to religion for their meaning. In science, we observe rational processes that deliver therapies for healing; and in Judaism, we give value to those processes that facilitate life-saving outcomes, which provide us hope for healing and gratitude when it comes. Ironically, the role of visiting the sick, then and now, remains virtually the same. In the past, the rabbis also wondered, “What difference can it really make if all healing is the will of God?” They explained that “One person’s visit removes 1/60th of the sick person’s illness” (Bava Metziah 30b). Did they conclude, therefore, that if 60 persons visited the infirm, that the illness would be removed? The only answer was to say, “Halavai,” it should only be so. All the more so, in our day, when science and medicine heal us, what difference does our visiting the sick make if all healing is in the realm of science? Yet, the rabbis’ explanation remains a vital reason why we visit the sick. As in the past, we don’t expect that if 60 persons visited the sick that the illness would be removed; but, we still favor the odds that in addition to science and medicine, a visit to the sick provides hope that faith in God’s presence, as a source of all that contributes to well-being including science and medicine, is expressed in the presence of a friend or loved one and in the context of a shared religious faith. At the end of June, just as summer plans were about to unfold, my youngest daughter grew ill. She was hospitalized for three weeks with atypical pneumonia, weakness and pain. The skill of doctors, three antibiotics, and therapies to restore her strength and endurance earned our enormous gratitude for the return of our daughter’s happiness and well-being. 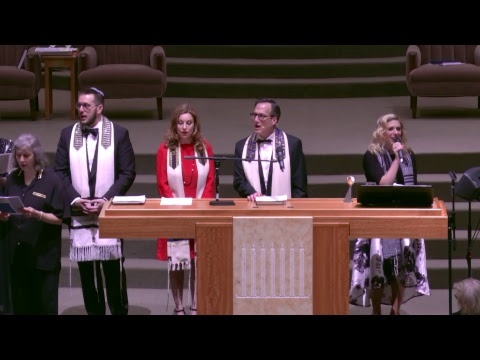 But, the glue, so to speak, that surrounded her and us was the faith we found in personal visits and phone calls from family, friends and rabbis, and the focus on healing we felt when we shared a prayer, together. All of it mattered. The role of science was obvious. The role of visits and prayer served to encourage our daughter to believe that she wasn’t alone and that healing will come. Today, she’s rebuilding her strength and preparing for the beginning of her first semester in college. Though it could have gone from bad to worse, we were fortunate and she recovered. Others in the children’s wing and PICU didn’t fare as well. Where science failed, the role of the chaplain or minister came to the family’s side. As they made their way, I remember what a friend and retired physician helped me understand about the difference between being healed and being cured. None of us will exit this world cured of the illness that takes us; but, some of us will exit this world healed, anyway. He explained that a cure depends on science that removes illness. Healing, however, can come to a person’s heart and soul even when there’s no cure. Patients with a terminal illness can seek perspective, express gratitude, and know peace before life ends. They will never be cured, but they might be able to say that before death came, they felt healed from life’s pains and ambiguities. Conversations with loved ones, time to forgive and be forgiven, and expressions of gratitude for the life that was granted can lead to healing of one’s mind and spirit.